Alonso stands on his Ferrari in parc ferme and takes the applause. Another faultless performance from the Spaniard - he's really making himself the championship favourite now. Button tells Vettel he's under investigation for the overtaking move, and Vettel says he didn't know if Button was still on the inside so left space. Craig emails in to say: "Let's hope it's sorted before the podium!" but I'm afraid it isn't. Alonso jumps on to the top step and takes the applause as the Spanish national anthem rings out for the third time this season. Alonso is still yet to finish a race and now holds a clear lead in the championship - 34 points over Webber and 36 over Vettel. As it stands. Raikkonen's fourth place moves him above Hamilton in to fourth on 95 points - 59 points behind Alonso. Starting to become a three-horse race with the Prancing Horse on top. Alonso and Pat Fry raise their trophies above their heads, and after Vettel and Button do likewise the champagne starts to flow. It's time for us to go, thanks for all of your comments during the race and make sure you stick with ESPNF1.com for all the reaction to the race and to see if Vettel keeps that second place. Not long until the next race either - we'll be back for the Hungarian Grand Prix next weekend. Bye for now. Alonso now five seconds clear of Vettel. He's measured this race superbly. This Ferrari is a very good car now. 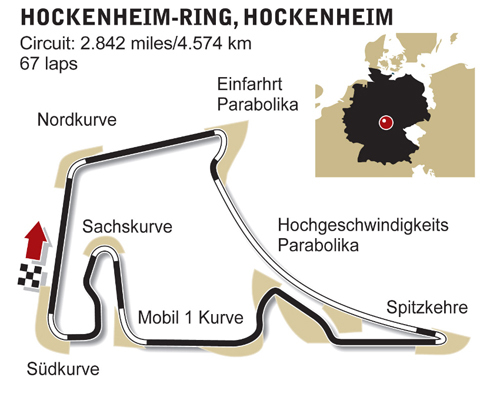 He comes through the stadium section and takes the chequered flag: FERNANDO ALONSO WINS THE GERMAN GRAND PRIX. Vettel comes home second and Button in third place. Raikkonen is fourth ahead of Kobayashi and Perez - a good day for Sauber - while Schumacher is seventh. Webber, Hulkenberg and Rosberg complete the top ten. Phil asks if Vettel is allowed to pass Button off the track - and the stewards have just said that the overtaking incident is under investigation. It was tight but I think Vettel will get away with it. Alonso's got this race won. Vettel uses DRS as Button's tyres go off. Button defends the inside line in to the hairpin. Vettel runs wide off the track but still drives around the outside of Button. Button complains that he passed him off the circuit and McLaren says "the FIA are away"
Alonso puts the hammer down and pulls his lead out to 2.4s. Vettel again uses DRS but again isn't quite close enough. He's all over the back of Button through the middle sector. Schumacher unable to make any more impression on Perez. Button with a slower lap, he's fallen 1.9s behind Alonso and has Vettel well within DRS range... Vettel doesn't attack but Button seems to be struggling now. He did pit first out of the leaders. Alonso does a good lap 0.2s quicker than Button. Unless one of the leading three have tyre issues you can see it staying this way to the flag. Schumacher is now 1.6 behind Perez, while Raikkonen does a slow lap in fourth and Kobayashi is 5.6s behind.